On 12 June 2010 the Historic Sites and Monuments Board of Canada hosted a ceremony to commemorate the founding of The Royal Canadian Legion in November 1925. 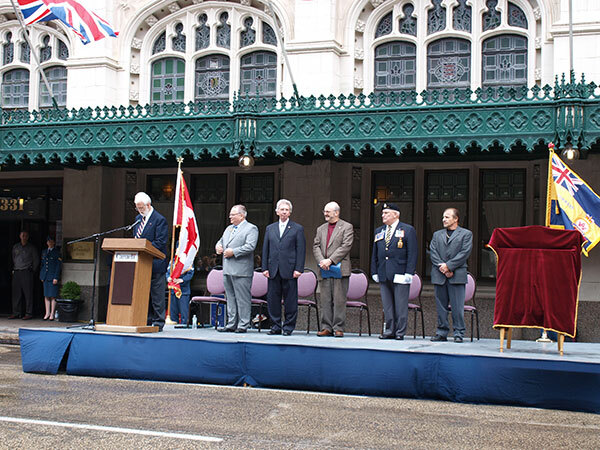 The event was held in conjunction with The Royal Canadian Legion’s 43rd Dominion Convention on Smith Street, Winnipeg, directly in front of the Marlborough Hotel, the site of the organization’s founding as well as its first Dominion Convention. Since its establishment seven years after the end of the First World War, The Royal Canadian Legion has remained Canada’s largest veteran-based social and advocacy organization. The ceremony was attended by, among others, the Minister of Veterans Affairs, the Hon. Jean-Pierre Blackburn, Mr. Wilf Edmond, Dominion President of The Royal Canadian Legion, and Dr. Robert O’Kell, Manitoba Member of the Historic Sites and Monuments Board of Canada. Participating in the unveiling of a plaque for the founding of the Royal Canadian Legion in front of Winnipeg’s historic Marlborough Hotel on 12 June 2010 were (L-R): Dr. Robert O’Kell, Manitoba Member of the Historic Sites and Monuments Board of Canada; Mr. Grant Nordman, Winnipeg city councillor for the St. Charles Ward; Hon. Jean-Pierre Blackburn, Minister of Veterans Affairs; Mr. Glenn Wright, Historian; Mr. Wilf Edmond, Dominion President, The Royal Canadian Legion; and Mr. Manfred Boehm, Proprietor and Director of The Marlborough Hotel. The First World War is widely held to be a landmark in Canadian national development. Although she entered the war in 1914 as a colony, by 1918 Canada was emerging as a nation in her own right. The young nation underwent many trials, one of which was the repatriation of hundreds of thousands of returning servicemen. Of the Allied forces, Canada was a leader in devising plans for the retraining of disabled soldiers. In addition, this country’s pension rates were among the most generous in the world. In short, Ottawa had prepared for returning Canadian armies with a care and foresight that was virtually unique among the combatting nations. Despite its best intentions, however, Ottawa was unable to address all the needs of the returning servicemen. As a result, several small associations of ex-soldiers banded together throughout the country in an effort to provide comradeship and help with medical and financial needs not provided by the Crown. The founding meeting of the Canadian Legion of the British Empire Service League (later renamed The Royal Canadian Legion) took place at the Marlborough Hotel, 331 Smith Street, Winnipeg, from 25 to 27 November 1925. That meeting led to the establishment of Canada’s largest veteran-based social, service and advocacy organization. Founded on the twin pillars of loyalty and comradeship, the Legion’s primary purpose since inception has been service to the veteran (and his or her dependents) and perpetuating the memory of those who served. Sir Douglas Haig (1861-1928), Earl of Bemersyde and Commander of the British Expeditionary Force during most of the First World War, met with representatives of local military organizations on the grounds of Manitoba’s Government House on 7 July 1925. The Legion’s advocacy efforts have facilitated such benefits for veterans as the War Veterans Allowance Act, the Veterans Charter, the formation of the Department of Veterans Affairs, the Veterans Independence Program, and the new Veterans Affairs Charter of 2006. The legacy of the Legion does not end with its unrelenting service to those who fought in the name of Canada. In fact, its program of remembrance, funded through the annual Poppy Campaign, has kept the memory of veterans and their sacrifices alive for Canadians and helped incorporate major military conflicts, particularly the First and Second World Wars, with their losses and triumphs, into the fabric of our national identity. Founded here in November 1925, The Royal Canadian Legion is Canada’s largest veteran-based social and advocacy organization. Dedicated to serving veterans and perpetuating their memory, it pushed for the passage of the War Veterans Allowance Act and veterans charters, as well as for the creation of the Department of Veterans Affairs and the Veterans Independence Program. The Legion’s Remembrance Program and annual Poppy Campaign remind Canadians of the men and women who served and of their sacrifices, and have helped weave military history into the fabric of our national identity. La Légion, le plus important organisme d’anciens combattants au pays, a été fondée ici en novembre 1925. Ce groupe perpétue le souvenir des vétérans, leur offre maints services et milite ardemment en leur nom, ayant lutté pour l’établissement de la Loi sur les allocations aux anciens combattants, de chartes, du ministère des Anciens combattants et du Programme pour l’autonomie des anciens combattants. Avec son Programme du souvenir et sa campagne annuelle du Coquelicot, la Légion rappelle le service et le sacrifice des hommes et des femmes ayant servi la patrie, intégrant l’histoire militaire à notre identité nationale.